A dark tone feisty red. A range of red shades, which are perfect to enhance the romance on valentines day. A range of red shades varying from light to dark red. Can use cat eye magnets, which consist of different designs, to create amazing looking nails. Create the ideal design on your nails with the Cat Eyes Magnet. Can be used at anywhere, at any time. Create beautiful designed nails with this easy application. Products manufactured in the UK, Germany, Poland, Netherlands, USA, China and Korea. Continually offer the latest formulas in there brand, to give the nails a professional finish. Pure Nails aim is to give the best service to its customers. Developing a new range, so that their is a colour to suit everyone's taste. Developing a range of treatments to keep all their customers happy with healthy cuticles. Remove any excess cuticle, then gently buff the nails to remove any surface shine. Clean the nail plate with the Nail Prep, to remove any remaining dust and oil. Apply a thin layer of Halo Base Coat, which seals the free edge of the nails. Cure the nails for 60 seconds under a 12w LED Lamp or for 120 seconds under a 36w UV Lamp. 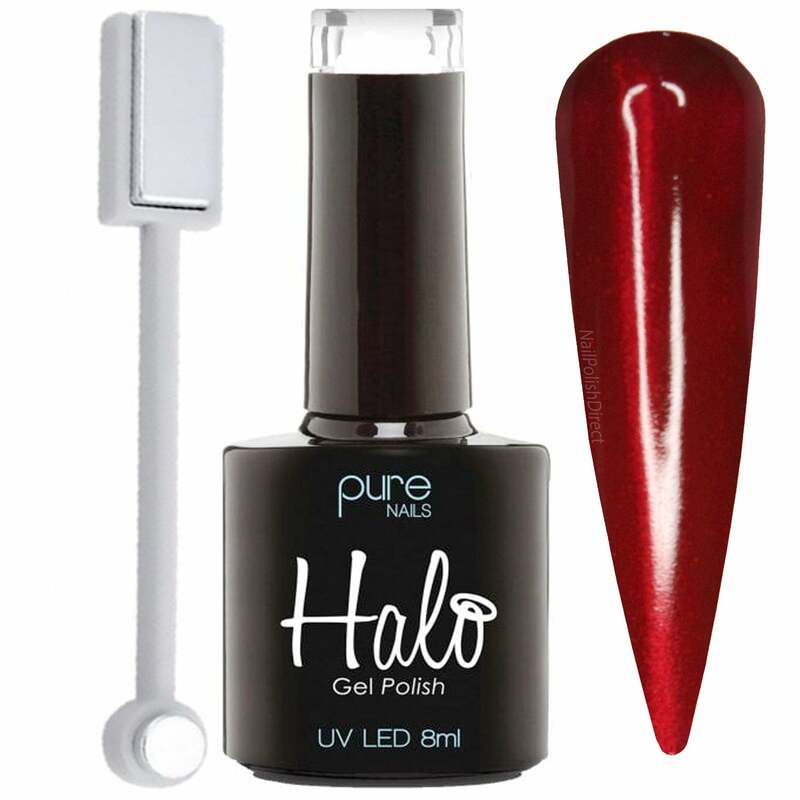 Apply a thin layer of Halo Gel Polish to the nails, which will then seal the free edge of the nails. Apply the magnet over the gel before curing to create the pattern. Apply a second layer of Halo Gel Polish, Repeating the previous steps and seal the free edge of the nails. Once this has been done, apply a thin layer of Halo Top Coat again sealing the free edge of the nails and then cure under the light. Wait for 5 seconds and then wipe the sticky layer with a gel cleanser with a lint free wipe. Gently buff the shine from the Halo Gel Polish that has been applied, with a buffer. Soak a lint free wipe with acetone remover, apply it around your nails. Once it is applied around your nails, wrap with nail foil. Remove the foil and simply slide of any excess gel polish their may be with a manicure stick.